Kurt Welter (25 February 1916 – 7 March 1949) was a German Luftwaffe fighter ace and the most successful Jet Expert of World War II. [Note 1] A flying ace or fighter ace is a military aviator credited with shooting down five or more enemy aircraft during aerial combat. He claimed a total of 63 aerial victories—that is, 63 aerial combat encounters resulting in the destruction of the enemy aircraft—achieved in 93 combat missions. He recorded 56 victories at night, including 33 Mosquitos, and scored more aerial victories from a jet fighter aircraft than anyone else in World War II and possibly in aviation history. However this score is a matter of controversy; research of Royal Air Force losses suggests Welter overclaimed Mosquito victories considerably. Welter was born in Cologne-Lindenthal (Köln-Lindenthal) on 25 February 1916. He joined the military service of the Luftwaffe in 1934 and was trained as a pilot. He showed a strong natural ability as a pilot and was subsequently selected for flight instructor training and served many years as a flight instructor. In 1943 Welter transferred to an operational night fighter unit flying contemporary piston engine fighter aircraft. On 18 October 1944, after 40 combat missions, Welter was awarded the Knight's Cross of the Iron Cross. In early 1945, Welter transferred to an experimental jet night fighter unit flying the Messerschmitt Me 262. On 11 March 1945 he was awarded the Knight's Cross of the Iron Cross with Oak Leaves for 48 aerial victories. Welter survived the war and was killed in an accident at a railroad crossing on 7 March 1949. Welter was born on 25 February 1916 in Cologne-Lindenthal. Following schooling and completing a merchant apprenticeship, he joined the Luftwaffe on 1 October 1934 and was trained as a pilot. Because of his skill as a pilot he was trained as a flight instructor. During World War II, Welter was promoted to Feldwebel on 1 August 1940 and transferred to flight training school Flieger-Ausbildungs-Regiment 63 and later on to the flight instructor school at Quedlinburg. Here Welter served as a flight instructor until 10 August 1943 when he was transferred to Blindflugschule 10 (school for instrument flight training) in Altenburg with the rank of Oberfeldwebel as a night fighter instructor. On 2 September 1943, Welter was transferred to 5. Staffel (5th squadron) of Jagdgeschwader 301 (JG 301), a night fighter squadron that experimented with the use of largely radar-less single-seat Focke-Wulf Fw 190A-5 and Fw 190A-6 fighter aircraft by night, often equipped with the FuG 350 Naxos radar detector, used in the form of German night-fighter operations without AI radar — due to Düppel interference from RAF Bomber Command aircraft. These free ranging interception operations were called Wilde Sau (wild boar). On his first Wilde Sau intercept mission against Allied bombers on the night of 22 September 1943, Welter shot down two Allied four-engine bombers. He shot down a further two on his third mission on the night of 3 October 1943. By the beginning of April, he had accumulated 17 victories in only 15 missions. Subsequently on 10 May 1944 Welter was awarded the German Cross in Gold. Leutnant Welter was transferred to 5. Staffel/Jagdgeschwader 300 (JG 300) on 7 July 1944. In July, Welter claimed two United States Army Air Forces (USAAF) Boeing B-17 Flying Fortress four-engined bombers and three North American P-51 Mustangs, two of which claimed on 19 July between Munich and Memmingen, shot down by day. From 25 July 1944, Welter served with 1. Staffel/Nachtjagdgruppe 10 (NJGr 10) performing further Wilde Sau missions. He claimed four Royal Air Force (RAF) Avro Lancaster four-engine heavy bombers shot down on the night of 29 August 1944 to record his 24th through 27th victories. Welter transferred to 10./JG 300 on 4 September 1944. 10. Staffel/JG 300 was established to counter intrusions by the RAF's fast de Havilland Mosquito twin-engined bombers, flying specially optimized for speed Messerschmitt Bf 109G-6/AS fighters. In September, Welter claimed seven Mosquitos downed, including one by ramming. It is thought that during his service with 1./NJG 10 and 10./JG 300, Welter recorded 12 victories in only 18 missions. On the night of 19 September 1944, according to Hinchliffe, Welter may have shot down Wing Commander Guy Gibson who was leading a 300-bomber attack on Mönchengladbach and Rheydt. Gibson's Mosquito crashed near Steenbergen in the Netherlands. Welter was the only German pilot to have claimed a Mosquito. The claim is unlikely. Welter submitted his victory claim north of Wittenberg in eastern Germany, some hundreds of miles away from the place Gibson's Mosquito was found. Recent research suggests that his victim was Mosquito VI serial PZ177 of No. 23 Squadron RAF which was shot down at 8,000 metres (26,000 ft) west of Bad Münder, Holzminden. The crew, F/O. K. Eastwood and Navigator F/L. G.G. Rogers were both killed. Welter was awarded the Knight's Cross of the Iron Cross (Ritterkreuz des Eisernen Kreuzes) on 18 October 1944 for 33 victories in just 40 missions. Neptun radar-equipped Me 262B-1a/U1 in the South African National Museum of Military History. On 2 November 1944, Welter was transferred to II. Gruppe/Nachtjagdgeschwader 11 (NJG 11), a reformation of his former unit. Here he was given command of a special Kommando subordinate to II./NJG 11, set up on 11 November 1944 at Erprobungsstelle Rechlin's southern Lärz airbase (2 November 1944 – 28 January 1945), and dedicated to performing nocturnal interception with the Messerschmitt Me 262 jet fighter of RAF Mosquitos attacking the Berlin area. According to some sources, Oberleutnant Welter added a Lancaster to his growing list of Mosquitos on the night of 12 December 1944, the first night victory by a jet fighter. Other sources state that his first aerial victory flying the Me 262 was claimed either on the night of 2 January 1945 or 5 January 1945. On 28 January 1945, the unit initially known as Sonderkommando Stamp, named after its founder Major Gerhard Stamp and then Sonderkommando Welter, was re-designated 10. Staffel/NJG 11 and transferred to the airfield at Burg near Magdeburg (28 January 1945 – 12 April 1945). The unit was equipped with Me 262 jet fighters, and tasked with intercepting Mosquito bomber aircraft of No. 8 Group RAF in the Berlin area. 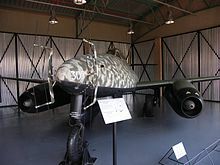 The Me 262 were not fitted with radar and used the aid of ground control and the searchlight defences, partially a Wilde Sau form of night combat. Welter had claimed three aerial victories while flying the Me 262 by early February 1945. Thereafter, Welter made a string of questionable air combat claims against Mosquito aircraft in the Berlin area – three on the night of 21 February 1945 (no Mosquitoes recorded lost),[Note 2] and another three on the night of 2 March 1945 (one Mosquito damaged in aerial combat). 10./NJG 11 made further claims against Mosquito aircraft attacking Berlin on the nights of 21 March 1945 (three claims; one Mosquito lost), 23 March 1945 (three claims; one Mosquito lost, another damaged in aerial combat), 24 March 1945 (two claims; one Mosquito damaged in aerial combat), 27 March 1945 (two claims; two Mosquitos lost), 30 March 1945 (four claims; one Mosquito lost and another damaged in aerial combat), 2 April 1945 (one claim; one Mosquito lost), 3 April 1945 (two claims; one Mosquito lost and another damaged in aerial combat), and 19 April 1945 (two claims, no Mosquitos lost). The last known aerial combat claim by Welter occurred on the night of 3 April 1945, when a Mosquito of No. 139 Squadron RAF, was shot down over Berlin. Welter was awarded the Knight's Cross of the Iron Cross with Oak Leaves (Ritterkreuz des Eisernen Kreuzes mit Eichenlaub) on 11 March 1945 for 48 victories. Much of the controversy surrounding Welter's claims for success in nocturnal aerial combat with the Me 262 stems from a memorandum written by Welter on 29 May 1945 for his British captors. In this memorandum Welter stated that between December 1944 and the end of January 1945, as the sole pilot of Kommando Welter, he flew seven Me 262 sorties and achieved three victories against Mosquito aircraft and two victories against Lancaster aircraft. Welter further stated that from the formation of 10./NJG 11 on 28 January 1945 to the end of the war, 10./NJG 11 flew around another 63 operational sorties and claimed a further 38 victories against Mosquito aircraft at night and five victories against Mosquito aircraft by day; his share being 20 Mosquitos at night and two during the day. Thus, according to the memo, a total of 25 Mosquitoes and two Lancasters were claimed in aerial combat by Welter, flying the Me 262 with the Kommando/Staffel, while other pilots of the Staffel claimed a further 21 kills (of which three were achieved with the two-seater Me 262). Official Luftwaffe documents show that by 4 April 1945, 10./NJG 11 had claimed 34 aerial victories, of which only one was claimed in a two-seater Me 262. [Note 3] Research of RAF records show that at most 15 Mosquitoes could have been possibly destroyed by Kommando Welter—10./NJG 11. Officially Kurt Welter was credited with 63 victories in 93 missions, of which 56 victories were achieved at night and seven by day. Among his claimed 63 victories are up to 33 Mosquitos. Thus, there remains some controversy about the exact number of victories achieved while flying the Me 262, with only three of the Mosquito kills coinciding with RAF records; he may have been guilty of overclaiming. Welter survived the war and was employed at a sugar factory. He was killed on 7 March 1949 in Leck in Schleswig-Holstein waiting at a level crossing, when logs falling from an improperly loaded passing train crushed his car. Foreman, Matthews and Parry, authors of Luftwaffe Night Fighter Claims 1939 – 1945, list 58 nocturnal victory claims, numerically ranging from 1 to 59, omitting the tenth claim. In addition to the nocturnal victory claims, authors Lorant and Goyat of Jagdgeschwader 300 "Wilde Sau" list five further day-time claims. This color coding indicates a day-time aerial victory claim. ^ According to Obermaier on 20 March 1944. ^ According to Fellgiebel and Von Seemen as Leutnant and pilot in the 2./NJG 11. ^ Spick 1996, pp. 3–4. ^ Samuel 2004, p. 46. ^ Smith & Creek 2000, p. 453. ^ Stockert 2008, p. 133. ^ a b c d e f g Obermaier 1989, p. 73. ^ Lorant & Goyat 2005, p. 237. ^ Morgan & Weal 1998, p. 63. ^ Hinchliffe 1998, p. 294. ^ a b c d e Foreman, Matthews & Parry 2004, p. 217. ^ "Archive Report: Allied Forces". Aircrew Remembered. Retrieved 30 August 2015. ^ Radinger & Schick 1993, p. 74. ^ Boiten & Mackenzie 2008, p. 212. ^ Hinchliffe 1998, p. 306. ^ Boiten & Mackenzie 2008, p. 208. ^ Boiten & Mackenzie 2008, p. 275. ^ Boiten & Mackenzie 2008, p. 289. ^ Boiten & Mackenzie 2008, p. 341. ^ Boiten & Mackenzie 2008, p. 342. ^ Boiten & Mackenzie 2008, p. 343. ^ Boiten & Mackenzie 2008, p. 347. ^ Boiten & Mackenzie 2008, p. 348. ^ a b c Boiten & Mackenzie 2008, p. 353. ^ Boiten & Mackenzie 2008, p. 363. ^ Morgan & Weal 1998, p. 64. ^ Boiten & Mackenzie 2008, p. 350. ^ a b Boiten & Mackenzie 2008, p. 351. ^ Radinger & Schick 1993, p. 75. ^ Stockert 2008, p. 134. ^ Foreman, Matthews & Parry 2004, pp. 115–247. ^ Lorant & Goyat 2005, pp. 377–378. ^ a b Foreman, Matthews & Parry 2004, p. 115. ^ a b Foreman, Matthews & Parry 2004, p. 119. ^ a b Foreman, Matthews & Parry 2004, p. 124. ^ Foreman, Matthews & Parry 2004, p. 125. ^ Foreman, Matthews & Parry 2004, p. 137. ^ Foreman, Matthews & Parry 2004, p. 138. ^ Foreman, Matthews & Parry 2004, p. 144. ^ Foreman, Matthews & Parry 2004, p. 149. ^ Foreman, Matthews & Parry 2004, p. 150. ^ a b Foreman, Matthews & Parry 2004, p. 156. ^ Foreman, Matthews & Parry 2004, p. 157. ^ Foreman, Matthews & Parry 2004, p. 158. ^ a b Lorant & Goyat 2005, p. 377. ^ a b c Lorant & Goyat 2005, p. 378. ^ Foreman, Matthews & Parry 2004, p. 211. ^ Lorant & Goyat 2005, p. 383. ^ a b c d Foreman, Matthews & Parry 2004, p. 214. ^ Foreman, Matthews & Parry 2004, p. 215. ^ a b Foreman, Matthews & Parry 2004, p. 216. ^ a b c Bowman 2016. ^ Foreman, Matthews & Parry 2004, p. 219. ^ Foreman, Matthews & Parry 2004, p. 221. ^ Foreman, Matthews & Parry 2004, p. 225. ^ Foreman, Matthews & Parry 2004, p. 228. ^ Foreman, Matthews & Parry 2004, p. 229. ^ Foreman, Matthews & Parry 2004, p. 230. ^ a b Foreman, Matthews & Parry 2004, p. 231. ^ a b c d Foreman, Matthews & Parry 2004, p. 237. ^ a b c Foreman, Matthews & Parry 2004, p. 238. ^ Foreman, Matthews & Parry 2004, p. 240. ^ a b Foreman, Matthews & Parry 2004, p. 243. ^ a b c Foreman, Matthews & Parry 2004, p. 244. ^ a b c d Foreman, Matthews & Parry 2004, p. 245. ^ Foreman, Matthews & Parry 2004, p. 246. ^ a b c d e Foreman, Matthews & Parry 2004, p. 247. ^ Patzwall 2008, p. 201. ^ Patzwall & Scherzer 2001, p. 505. ^ a b Thomas 1998, p. 434. ^ a b Scherzer 2007, p. 777. ^ Fellgiebel 2000, p. 441. ^ Von Seemen 1976, p. 355. ^ Von Seemen 1976, p. 56. Boiten, Theo; Mackenzie, Roderick (2008). The Nachtjagd War Diaries. An Operational History of the German Night Fighter Force in the West. Volume Two April 1944 – May 1945. Walton on Thames, UK: Red Kite. ISBN 978-1-906592-00-4. Bowman, Martin (2016). German Night Fighters Versus Bomber Command 1943–1945. Barnsley: Pen and Sword. ISBN 978-1-47384-979-2. Foreman, John; Matthews, Johannes; Parry, Simon (2004). Luftwaffe Night Fighter Claims 1939 – 1945. Walton on Thames, UK: Red Kite. ISBN 978-0-9538061-4-0. Lorant, Jean Yves; Goyat, Richard (2005). Jagdgeschwader 300 "Wilde Sau" - Volume One: June 1943 – September 1944. Hamilton, MT: Eagle Edition. ISBN 978-0-9761034-0-0. Morgan, Hugh; Weal, John (1998). German Jet Aces of World War 2. London; New York: Osprey Publishing. ISBN 978-1-85532-634-7. Patzwall, Klaus D. (2008). Der Ehrenpokal für besondere Leistung im Luftkrieg [The Honor Goblet for Outstanding Achievement in the Air War] (in German). Norderstedt, Germany: Verlag Klaus D. Patzwall. ISBN 978-3-931533-08-3. Radinger, Willy; Schick, Walther (1993). Messerschmitt Me 262 Development Testing Production. Atglen, PA: Schiffer Publishing. ISBN 978-0-88740-516-7. Samuel, Wolfgang W.E. (2004). American Raiders – The Race to Capture the Luftwaffe's Secrets. Jackson: University Press of Mississippi. ISBN 978-1-57806-649-0. Sims, Edward H. (1982). Jagdflieger Die großen Gegner von einst [Fighter Pilots The great Enemies of the Past] (in German). Stuttgart, UK: Motorbuch Verlag. ISBN 978-3-87943-115-1. Smith, J. Richard; Creek, Eddie J. (2000). Me 262 Volume Three. Crowborough, East Sussex, England: Classic Publications. ISBN 978-1-903223-00-0. Spick, Mike (1996). Luftwaffe Fighter Aces: The Jagdflieger and their combat tactics and techniques. Ivy Books. ISBN 978-0-8041-1696-1. Stockert, Peter (2008). Die Eichenlaubträger 1939–1945 Band 8 [The Oak Leaves Bearers 1939–1945 Volume 8] (in German). Bad Friedrichshall, Germany: Friedrichshaller Rundblick. OCLC 76072662. 1 Knight's Cross with JG 3. 2 Knight's Cross with KG 4, Swords with the 30th Fighter Division. 3 Oak Leaves with NJGr 10. This page was last edited on 31 October 2018, at 09:41 (UTC).